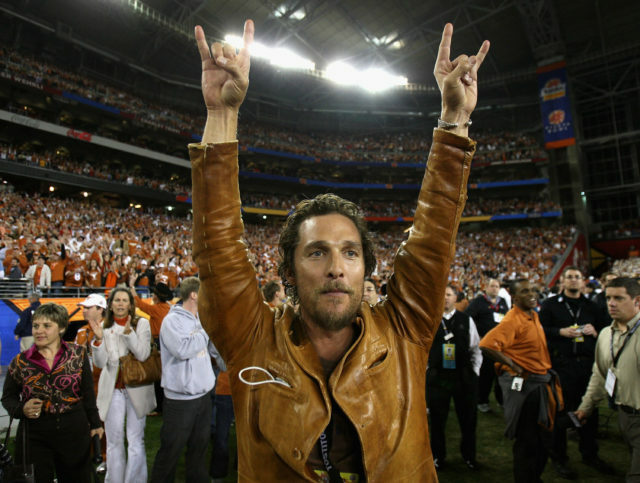 With the start of the season on the horizon, I think it’s an outstanding time to remember just how much Matthew McConaughey loves Texas Longhorns football. Is McConaughey the coolest guy alive or is he the coolest guy alive? The answer is an obvious yes and yes. I don’t know if there’s a single celebrity out there who loves college football as much as he does. I know that Texas won’t compete for a national championship this year, but it’s kind of shocking because those speeches have me ready to run through a slab of concrete. Can we just put McConaughey in the booth for the primetime game every Saturday night? Talk about generating rating, I’m pretty sure a billion people would tune in for that. ESPN needs to get it done because he might be the only man capable of bringing America back together.